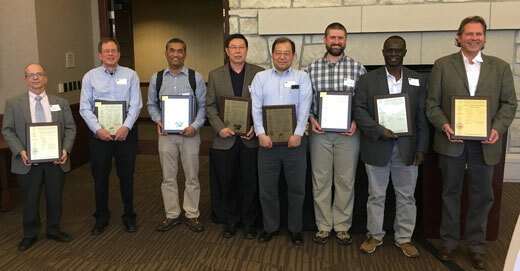 Tests to detect early stage cancers, herbicide-resistant sorghum and Hessian fly-resistant crops, devices that detect dangerous radiation, vaccines for a dangerous disease that affects both animals and humans, and drugs to treat Alzheimer's disease were among the innovations that Kansas State University researchers patented in 2017. K-State wheat breeders also received a plant variety protection certificate for a recently released variety. Provost April Mason and Vice President for Research Peter Dorhout hosted a reception on April 5 to honor 2017 patent and plant variety protection certificate recipients. Honorees received patent plaques, and first-time inventors received certificates from the National Academy of Inventors. The honorees join a long list of researchers who have worked with the Kansas State University Research Foundation, or KSURF, which facilitates and manages technology transfer for K-State faculty. Through the years, researchers and KSURF have collaborated on more than 250 patents. Dorhout said K-State has a strong record of innovations in a diverse array of fields. "Our researchers are committed to protecting our food supply, improving human health, and supporting the economic success of our state. They demonstrate that commitment by ensuring that their work makes it to the marketplace," he said. Chris Brandt, president of KSURF, said he is eager to assist researchers in their efforts to get their inventions in the hands of the public. "Our job is to help researchers protect and commercialize innovations, and we are excited to see the list of K-State inventors continue to grow at record pace," Brandt said. Tej B. Shrestha, anatomy and physiology. Deryl Troyer, anatomy and physiology. Donghai Wang, biological and agricultural engineering. Hongwang Wang, grain science and industry. Harold N. Trick, plant pathology. Steven L. Bellinger, nuclear engineering. William L. Dunn, nuclear engineering. Ryan G. Fronk, nuclear engineering. Douglas S. McGregor, nuclear engineering. John K. Shultis, nuclear engineering. Timothy Sobering, Electronics Design Laboratory. Matthew T. Basel, anatomy and physiology. Juergen A. Richt, diagnostic medicine and pathobiology. William W. Bockus, plant pathology. View a list of K-State patents awarded since 2009 or find K-State technologies that are available for licensing. For more information, contact the K-State Research Foundation at Tech.Transfer@ksu.edu or 785-532-5720 or visit a website that explains the commercialization process. Writer Lily Hoang to read from her work on Friday, 3:30 p.m.